Many Muslims attended church in France this Sunday to show compassion for slain priest, Father Jacques Hamel, and solidarity with their Catholic compatriots. Nowhere was the emotion stronger than in Rouen Cathedral, near Saint-Etienne-du-Rouvray, where the elderly priest had his throat slit in church, in the name of ISIL. “It is the same God. 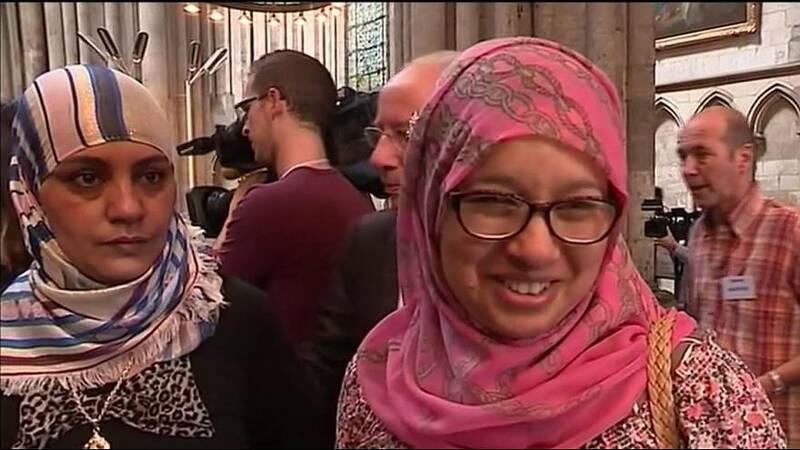 It is the house of God,” said one Muslim woman, among at least 100 who attended the Rouen service in a cathedral packed with nearly 2,000 worshippers. France’s Muslim Council urged those who follow Islam to attend Mass this Sunday. “It is a symbol. We want the spilled blood of Jacques Hamel to act as cement for more fraternity, more equality and greater ties between the communities,” said Mohammed Karabila, the President of Saint-Etienne-du-Rouvray mosque. Nuns held hostage amid Tuesday’s bloodshed and members of Jacques Hamel’s family also attended the service in Rouen. Muslims nationwide also answered the call to join Catholics at their Sunday Mass. With the priest’s teenage killers shot dead by police, the investigation is now broadening to see what help they may have had in committing France’s latest terrorist murder. A cousin of one of the pair, Abdel Malik Petitjean, has now been charged with a terror-related offence. Prosecutors have said the 30-year-old, identified only as Farid K., was well aware his cousin was about to commit a violent attack, albeit without knowing the time or place. What is anti-semitism and why is it spreading in Europe?